Halloween is just around the corner (I still can't believe it!) and my one year old is busy spending his Halloween season learning about spiders and pumpkins. We hung some fantastic striped paper spiders from his bedroom ceiling (purchased at a discount store for a few bucks). Of course we purchased pumpkins from a quaint pumpkin stand. And we "play pumpkins" --aka rearrange them all over the house--but the other day when he stumbled across the finger paints (and had a near breakdown because he wanted to fingerpaint so badly) I decided it was time to make some Halloween paintings! 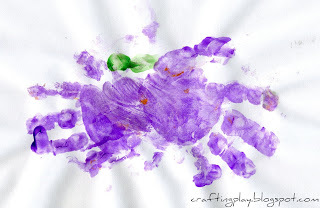 When we painted these, I would paint Ethan's palm and help him press it against the paper. We'd hit the paper semi-hard and say "SMACK! SMACK!" He loved it! We did the same thing with the fingerprints for the stems. 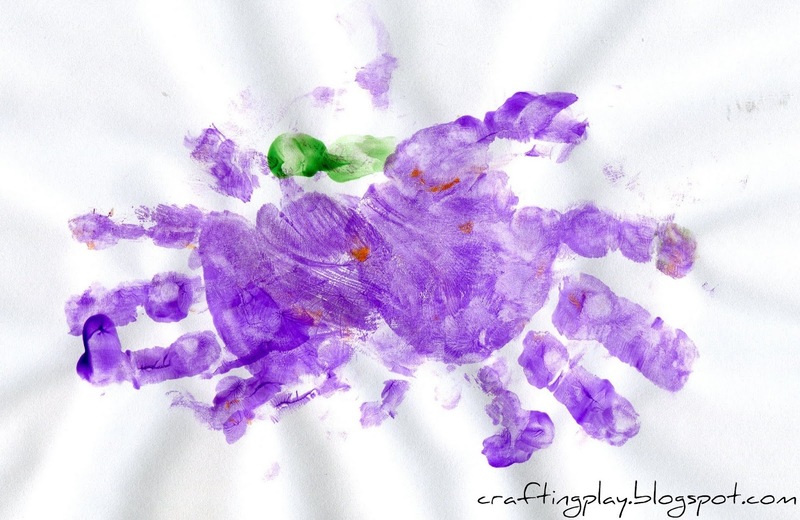 I've seen variations on the handprint spider all over the internet, but we thought we'd try our own! In retrospect, we would have only painted 8 fingers and not all 10, but Ethan surely didn't mind :) In this case, we also used fingerprints for eyes! How did you first introduce your little person to Halloween symbols?? 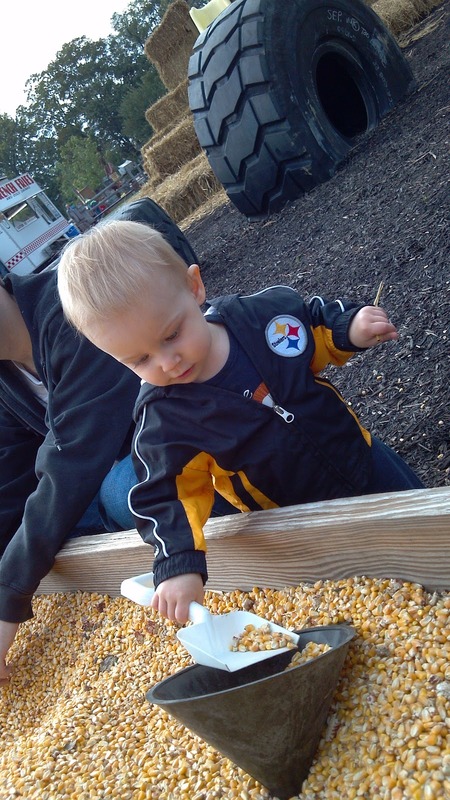 We recently took Ethan to visit "Corn Cob Acres" in Mountville, PA and had a blast! 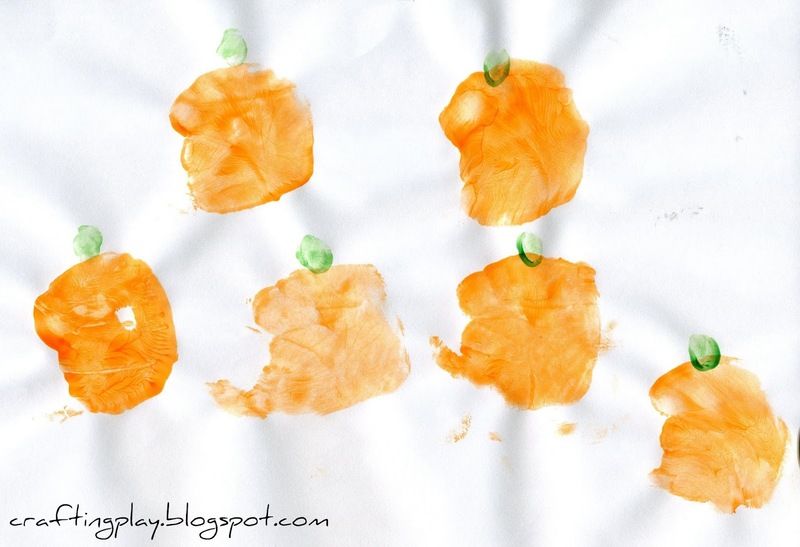 What a great seasonal activity for a young toddler!! Fun, fun, fun!! Ethan loved playing in the corn bin, the hayride, the cow inflatable bounce, and the haystack slide. However, I think his favorite was definitely the animal barrel train ride! He loved riding though the cornstalks in a cow. 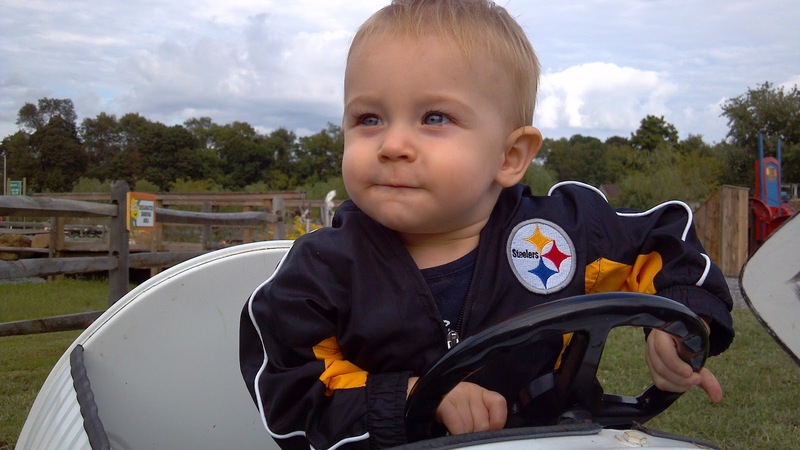 He also really liked riding the pedal carts with his daddy. It's always evident that you picked a great family activity when there are tears are you leave! I definitely recommend a visit before the fall season is over. Who knows, maybe we'll see you there?